Hi! I’m Neil. Thanks for stopping by. I enjoy playing and collecting retrogaming items and have set up www.RetroGamersClub.com to share my hobby with other like minded people. This site compliments my Twitter page @RetroGamersClub which has been active for about four years now. If you are on Twitter please feel free to follow me plus send me a message so I can follow back. As my experience of WordPress grows so will my website so please leave comments and ideas that could support with this. Any feedback would be appreciated as it can only help me move in the right direction! So a bit more about me……. I spent my younger years in Singapore, age 6 – 18, which I can only say was an experience of a lifetime. I will not share my age but when I mention my first memories of gaming were on Nintendo Game and Watches you can only guess, be kind!! Handheld wise after the Game and Watch stage I moved to Gameboy original and that was it for me as a youngster. My first console was the Atari 2600 Woody and I remember many an hours spent playing Combat, Space Invaders, Pac Man, Defender and Asteroids. I had the pleasure of toying with a ZX81 as a kid as well but some time in the early 80’s moved to a clone of an Apple II. The joys of living in Singapore and the availability of ‘genuine fake’ anything and everything worth having!! 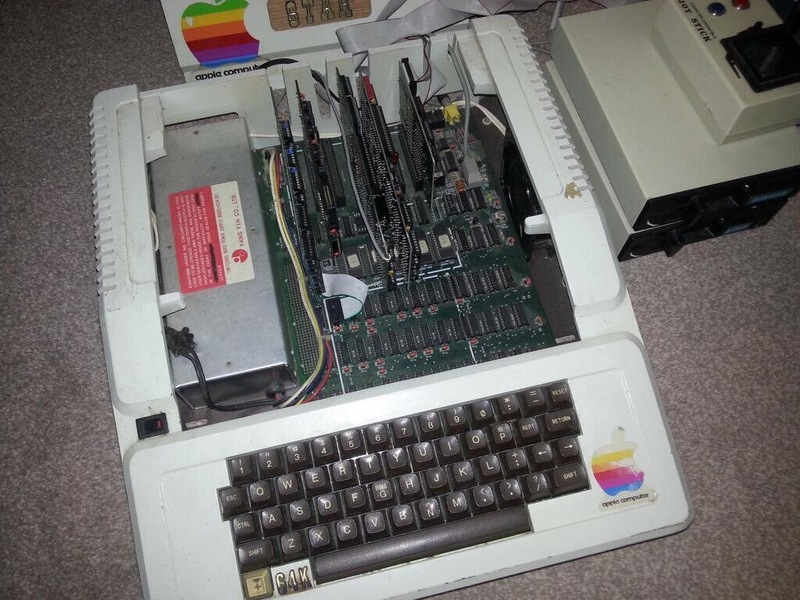 The ‘Apple II’ phase lasted many years, coming back to the UK with me for use whilst I was at Uni. Projects and essays printed on a Dot Matrix printer, the memories! 64k of power that survived years of use and is still in my collection today, 35 years on. As with all kids that had a ZX81 and any other PC, I dabbled with a bit of Basic programming enjoying copying script from books and tweaking them to see the impact. Seeing now how a lot of the programmers started off it’s a shame that I didn’t progress this further back in the day. Gaming wise I really enjoyed playing the board game Risk with my friends, resulting in a focus on strategic computer games and then hence the main game I played on my ‘Apple II’ being Ultima III (so want to boot it up right now!!). I played this game for quite a few years, keeping me busy in my spare time. I was not obsessed by gaming as a kid so also spent many an hour outside with my mates enjoying the warmth of Singapore. This did include Saturday’s exploring the Arcade venues to spend my pocket money on the likes of Space Invaders, Pac-Man, Galaxian, Defender and Operation Wolf. At Uni, in the UK, there was plenty of distractions to keep me away from being stuck in front of a TV but I did enjoy playing pinball and I still grab the opportunity when I can today. There is a great place in Southend with classic pinball machines that I frequently visit. Later years were spent on PS1, Xbox original and PS 2 consoles and I enjoyed a variety of games when I had the time. My first son experienced playing on the PS1 and I remember many an hour spent playing Croc with him, even if he couldn’t jump the lava himself. God it did my head in on occasions actually ‘dad, dad I need help, dad, dad come on’. That is where my gaming finished and writing this up I now wonder if that’s what did it for me lol. The three kids have enjoyed many an hour on all the modern generation consoles and handhelds but not me, who has 5 hours to play GTA V, I definitely don’t! I got into retrogaming collecting about 6 years ago to explore the numerous hardware changes over time plus to experience games I had not previous played. There was a very big Sega gap in my life that needed filling so this has gone a long way to help. I have collected the likes of Vectrex, Microvision, Neo-Geo pocket and Lynx (to name a few) which I would not have been aware of had I not started to dig deep into retrogaming history. My collection has just grown from there and through Twitter I have had the opportunity of chatting to and meeting like minded retro obsessed people. I originally set up my Twitter as @retro_fun but after a couple of years decided on the name RetroGamersClub, helped by the fact that the dot com domain was available. I have been slow starting my website due to family and work distractions but I am now focused on turning this around so I can further share this fantastic hobby with others. Like many a retrogaming collector it is not worth me sharing it with the other half as she just cant understand why I like it or why I have a room full of old gaming items. Each to there own but there’s no changing me, can’t take the retro out of Neil! Thanks for visiting and hope you enjoy my blog and website as it develops. PLEASE VISIT THE ‘CONTACT ME’ PAGE TO SEND COMMENTS AND SUGGESTIONS………….